We are all humans and in that respect we are all the same. Of course there are many differences between us but some things are fundamental and affect all of us. We love to think that we are intelligent. We are masters of the universe. We have created great art, we have created spectacles of construction, we have created electronic devices of amazing complexity and we have gone to the moon and back. Religion, philosophy etc, etc. We think we know a lot of stuff. And while our brains, can do some pretty amazing things, like anything else, like any tool, it has its weaknesses. Being human means we don’t like to think about those weaknesses in our own brains. We (or rather our brains) prefer to ignore those weaknesses and instead concentrate on feeling smug! Psychology tells us different. Psychology allows us to expose and understand these weaknesses, for until we expose and understand those weaknesses we will forever be ruled by them. Understanding and then accepting that we are a flawed species in our thinking and in our perceptions allows us to do something about those things. Those things are problems and the first step in solving any problem is to admit that it exists. Before an alcoholic can be “saved” they must first take the most important first step and admit they are an alcoholic. We must accept that we will make mistakes. Many many mistakes. All of us. The number of mistakes people make is not proportional to a person’s standing or seniority within an Enterprise. The CEO is liable to make the same number of mistakes as the person who cleans the toilets. What is proportional is the amount of damage that a mistake that goes uncorrected can have (in general). We must therefore accept that mistakes will happen and create an environment that allows us all to expose and correct those mistakes without resorting to blame. The people in your Enterprise that make mistakes and correct them (including you) are your best employees. Those that make mistakes and hide them can destroy your Enterprise. “Backtracking” or performing a “U-turn” should not be met with scorn, vilification and condemnation but instead with thanks and praise. Those that do not make mistakes are lying. 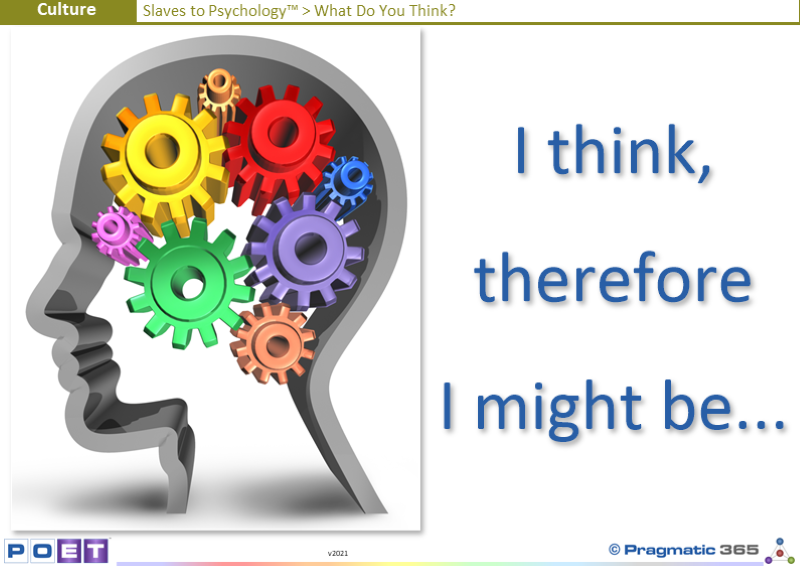 Do you think Psychology is important and Why? Do you think you make mistakes? What do you do when you make small mistakes? What do you do when you make big mistakes? What do others in your Enterprise do when they make small or big mistakes? Are people allowed to make mistakes? What happens to people who expose small mistakes? What happens to people who expose big mistakes? What happens to people who hide mistakes?